A new durable watertight solution for below ground structures. A pre-applied membrane that protects against groundwater ingress as well as gases and chemicals. DualProof is a fully and permanently bonded, pre-applied membrane. It is applied before the steel reinforcement is fixed and the concrete poured. It consists of a sealed two layer highly flexible PVC membrane laminated with a non-woven PP-fleece. DualProof is pre-applied and is installed without heat or open-flame, overlapped and sealed with butyl tape and special adhesive for detailing. The new PP FiberTex Technology gives the DualProof its unique bond and connection to the concrete. The PP-Fleece integrates into the concrete when poured giving a strong mechanical bond once cured. 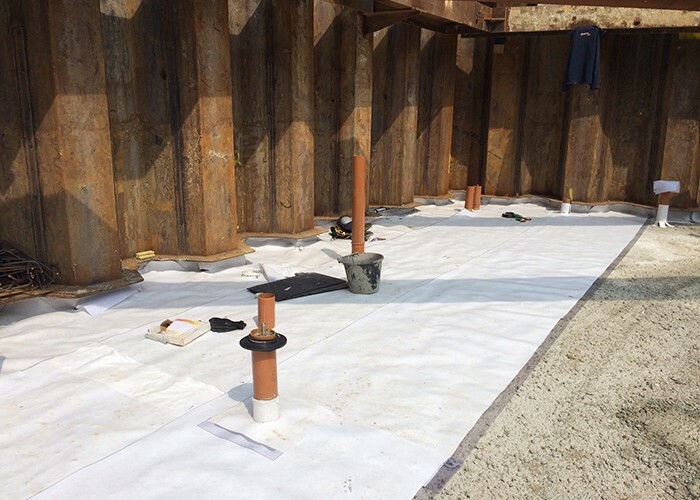 DualProof can be applied horizontally as well as vertically and is used in all applications where structures require protection against groundwater and seepage.